It's not every day that a major camera company touts a brand-new flagship product, but that's the agenda for the new Olympus OM-D E-M1. And there's a good reason. Olympus baked the the technology of its traditional E-Series mirrored DSLRs into a compact, mirrorless body that's similar to its recent Pen and OM-D models. The result is the best of both worlds: A professional-level mirrorless interchangeable lens camera with conveniently compact dimensions of 4.8 × 2.7 × 1.5 inches, weighing just under a pound. Olympus OM-D EM-1 with ergonomic grip. This digicam is designed to integrate two distinct lens systems—the four thirds and micro four thirds, offering full compatibility between them for the first time. To achieve this feat, the camera incorporates Dual Fast AF—two different auto focus systems: phase detection AF (when the four thirds lens is attached) and contrast detection AF (when the micro four thirds lens is attached). 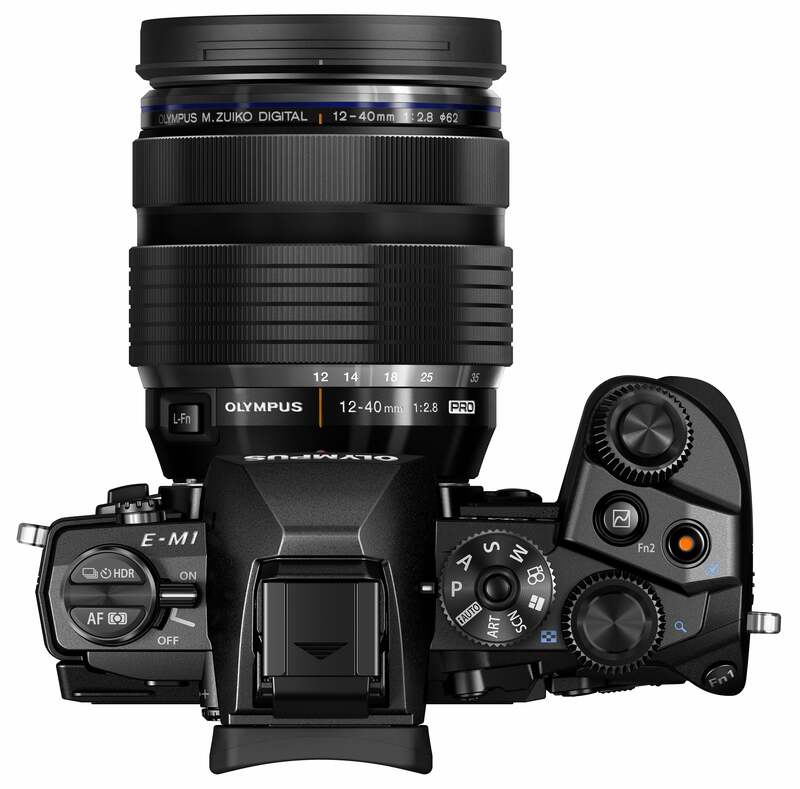 With this new model, Olympus had to choose between the mirrored classic DSLR (four thirds) approach and the mirrorless compact system camera (micro four thirds) approach. It chose the latter because of size, speed, response, and viewfinder magnification advantages. The choice of a compact body is not surprising. Hobbyists and enthusiasts are among the fastest-growing segments of the market—living in a smartphone environment that has made everyone more aware of ubiquitous photo opportunities. Cameras need to take great pictures, but also be more portable, swift, and easy to operate. Camera with attached HLD-7 Power Battery Holder. Micro four thirds cameras evolved from the four thirds standard several years ago—the former being even smaller and lighter. Both four thirds and micro four thirds systems use the same image sensor, but the newer models have a shorter lens-to-sensor distance, allowing their lenses (and thus the entire camera) to be smaller and lighter. This size/weight differential drives their growing popularity, even among advanced and professional shooters who crave a second, more-casual camera in addition to their weighty work model. And that's another area where the OM-D E-M1 is distinctive. It's not merely a second camera—it's a pro-level unit unit itself, though not a full-frame camera. The 2x2 Dial Control system lets you adjust four functions with the camera’s lever or two dials. The OM-D E-M1's 16.3-megapixel Live MOS sensor is paired with Olympus' new TruePic VII image processor, which supports 10 frames-per-second shooting in single autofocus mode and 6.5 fps in continuous autofocus mode. ISO range is 200-25600. It doesn't hurt that the Olympus OM-D E-M1, with its magnesium alloy body, is built to be more durable than its predecessors. Olympus has expanded the rugged dustproof and splashproof characteristics of previous models by adding freezeproof capabilities—with guaranteed operation down to 14 degrees Farenheit. As far as video goes, surprisingly, there's nothing special—it shoots at full HD 1920 x 1080 (16:9) 30p, 24Mbps (MOV)—while some Sony and Panasonic models support 60p. The ergonomic body provides easy access to all manual controls. The really significant breakthrough is that the Olympus OM-D E-M1 is designed to work with the entire Olympus lineup of 43 four thirds and micro four thirds Zuiko lenses on the same micro four thirds mount. Just to get everyone started, Olympus is debuting a brand-new lens for its new Pro line: the M.Zuiko Digital ED 12-40mm f2.8 Pro lens (24–80mm, 35mm equivalent), which can be purchased separately or as part of a kit with the new camera. The Zuiko Digital ED 40–150mm f2.8 Pro (80–300mm, 35mm equivalent) zoom lens, still under development, will be available next year. Despite the Dual Fast AF system, you still need an adapter to use the four thirds lenses, but auto focus for those lenses will now perform equally well for whichever lens is attached, for both stills and video. This technology can actually select the ideal AF method based on lens type and settings: choosing either 37-point On-Chip Phase Detection or 81-point Contrast Detection. Both work together to improve continuous autofocus tracking when a micro four thirds lens is attached and Continuous-AF mode is selected. Shooters can also use Group Target AF, Small Target AF for precise shots, or Super Spot AF for smaller subjects and macro shooting. 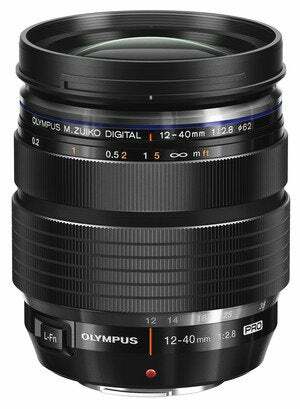 Olympus is debuting a brand-new lens for its new Pro line: the M.Zuiko Digital ED 12-40mm f2.8 Pro lens. The Olympus OM-D E-M1’s built-in five-axis Image Stabilization, alongside Multi-Motion IS, dramatically reduces the effects of camera motion and blur from five directions, and new algorithms make image stabilization more effective at low shutter speeds. IS-Auto mode automatically detects the camera's movements and corrects regardless of direction or camera orientation. Users can check image stabilization effects on the camera's Live View LCD screen or the viewfinder. The OM-D E-M1’s interactive electronic viewfinder features a 1.48x (35mm equivalent of .74x) magnification factor that rivals full-frame DSLR cameras, and it's paired with a three-inch tiltable 2.36 million-dot LCD panel. The display time for tracking moving subjects lags just 0.029 seconds, according to Olympus. You can use the LCD to try out different aspect ratios, magnification, color, and highlight and shadow, and confirm the effects of camera settings before taking your shot. An Adaptive Brightness Control feature automatically raises brightness when shooting in outdoor daylight conditions and lowers it in darker venues. A new Color Creator tool fine-tunes hue and color saturation via the Live View screen. Art filters, HDR settings, time lapse, and Photo Story mode offer additional artistic and special effects. The electronic viewfinder (EVF) is as large as a full-frame DSLR viewfinder and has added creative control. Accompanying the new internal technology, Olympus strives to make the camera professionally ergonomic in the hand. A built-in grip similar to that of its previous flagship OM-D E-M5 makes shooting with larger four thirds lenses more comfortable. The camera also has an external battery grip and a 2x2 Dial Control system that handily adjusts four popular functions with the camera’s lever or two dials: aperture/shutter speed, exposure compensation, ISO speed, and white balance. Scanning a QR code on the camera's LCD syncs the unit's Wi-Fi with your smart device of choice. The free Olympus Image Share 2.0 smartphone app for iOS and Android shows the camera's Live View on your smartphone, allowing you to control the camera remotely. The Olympus OM-D E-M1 will be available in October in black for $1400, body only. More information is availabe on the Olympus website.